The lease on my apartment ended at the end of April. Which would probably have made it the ideal time to pack all my stuff up, mail the rest home, and depart on my world tour. Only problem is, I couldn't bring myself to leave New York right on the cusp of Spring. There is nothing like Springtime in NYC. Seriously. That first day the sun comes out, the temperature gauge hits over 65, and the trees start to show the beginnings of flowers.....and the city goes wild. All the long-suffering winter-scarred residents pour into the streets, rooftops re-open, every restaurant drags seating onto their sidewalks, and birds sing Disney songs (in my head....and on my iPod. Psych.). All outdoor spaces....pure chaos. And I love. every. second. I am that person that hits up the Mister Softee truck in my new summer dress I purchased on that one day it hit 0 degrees in Feb., and then Yelp-searches restaurants with outdoor seating so I can drag my friends there to take photos of our french toast basking in the sun because we're SITTING OUTSIDE, Y'ALL, BECAUSE IT'S FINALLY SPRING. I did not suffer through the most miserably frigid winter ever (here's looking at you, giant ice puddles that tried to make me slip and die) to leave right at my favorite time ever. It's getting to be perfect 16 Handles weather. Not that this has stopped me in the winter. I digress. So I made the decision to at least stay in the city through the end of May. I looked at sublets for just the month, but was struggling with the idea of hauling my furniture somewhere for just a month, living with another stranger, and paying exorbitant rent; just so I could eat my 16 Handles outdoors. At brunch with friends one day, however, some of them offered up their apartments to me for various times they'd be out of town....and once I looked at the calendar on the dates I had a place to stay, there was only a week or two left that I needed housing. I filled those dates in with other friends....and I am now officially apartment-surfing in my last month in the city. Which means I am living out of bags (given that my suitcases now reside in Denver). Needless to say, planning out what to wear over the next six weeks while concurrently selling all my furniture, shipping all my worldly possessions home in boxes, planning out what to bring backpacking the world, moving out of the apt, and working, was kind of a recipe for disaster. My wardrobe for the next month of my life is themed "hobo", I've decided. One thing I have loved, though, is organizing everything. Living out of 10 large bags makes it pretty near impossible to find the things you need, which led me to start sub-categorizing my clothes into giant Ziploc bags. 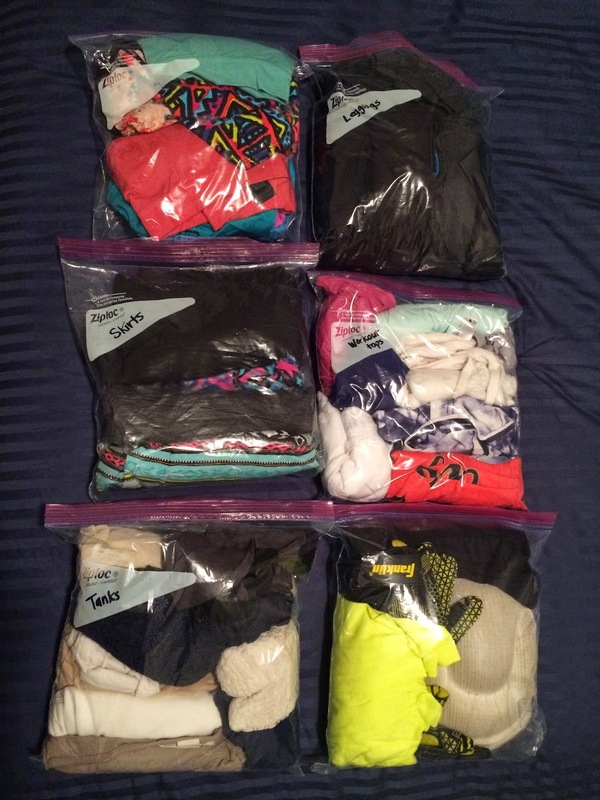 I separated my clothes into categories (tanks, leggings, socks, etc.) and with my new "roll everything into tiny rolls" packing technique, I am kind of OCD-y loving my bags-in-bags-in-bags lifestyle. Never mind that I am incredibly ill-equipped for any activities out of the norm, because most of my stuff got sent home. Like, if someone invited me to a tea party next week, I would be screwed. Or I could show up in workout gear, which is what I would possibly most definitely do, because I love tea. One downside of hobo life, where is my mail going now that I don't have an address? No idea. What is 16 Handles and could we get some while I am there? you kept your knee pads? The only thing I miss more than NYC in the spring is brunching on one of those outdoor patios eating french toast (read: eggs) with YOUUUUUUUU!